One of the major surprises at AirVenture 2018 was the unveiling of a cleverly designed multicopter design that has been quietly under development somewhere in northern Canada for the past seven years. Blackfly is an eight-rotor double canarded design with a boat-like hull that makes it amphibious and with an empty weight just under the basic ultralight limit of 364 pounds. With current battery technology, the single-place aircraft can fly about 32 nautical miles at 65 knots. 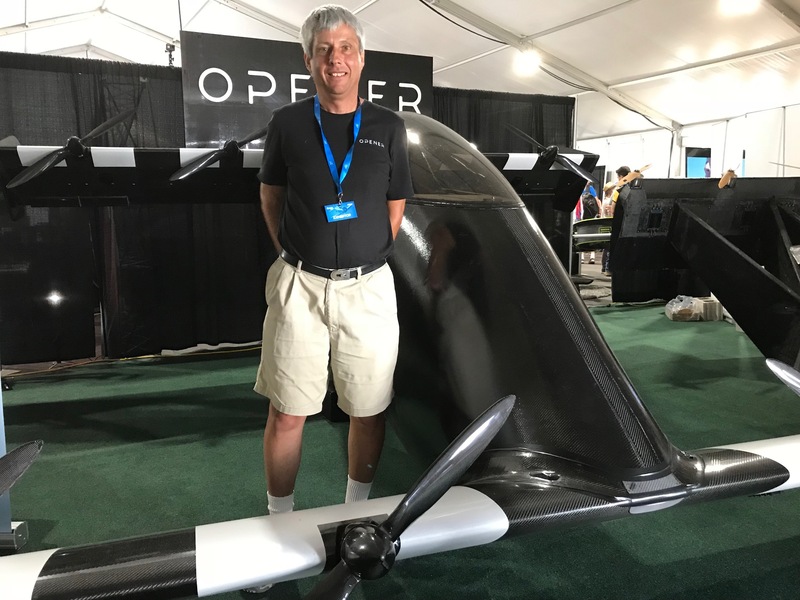 “Opener is re-energizing the art of flight with a safe and affordable flying vehicle that can free its operators from the everyday restrictions of ground transportation,” said Marcus Leng, CEO. Leng and his staff were overwhelmed with the attention the vehicle gathered at AirVenture. Long lines of people waited to see and photograph the latest version of the Blackfly, which Leng, an entrepreneur who “retired” at 36 said that as new technologies emerged in electric propulsion, automated controls and lightweight composite construction, the idea for the Blackfly emerged and matured at a secret northern location. A change of head office to Silicon Valley allowed Leng to team up with Google founder Larry Page for the project. There are several other high-powered leaders on the board of directors, including an astronaut and other adventurers. Leng continues to test the aircraft in Canada and it was accepted as a basic ultralight by Transport Canada in early July. That paves the way for production and sales and Leng said the goal is to keep the price low enough that its accessible for many. “We will offer competitive pricing in an endeavor to democratize three-dimensional personal transportation,” Leng said in a statement. He said he expects the price to be in the range of a new SUV but declined to elaborate. But ownership will come with responsibility. Leng said new owners will have to pass the written private pilot knowledge test and undergo flight training before they can take delivery. The aircraft has built in safety systems, including geo fencing and a “go-home” feature that will return it to its takeoff point if it senses lack of input from the pilot. Leng said the vehicle offers a practical way to revolutionize transportation.